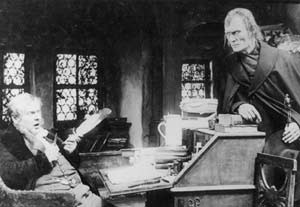 Destiny (Der Müde Tod, 1921), along with Fritz Lang’s succeeding effort Siegfried (1924), stands as one of the most essentially Expressionistic German films. The sto ry, part legend, part fairy tale, is primarily a dream-vision of a young woman who is searching for her missing lover. The dream consists of three elaborately conceived episodes involving the young lovers as they try to elude the murderous designs of a cruel tyrant, who is always aided by the Angel of Death. This three-stories-within-a-story compositional device was later adopted in Waxworks (1924). The long-lived power of DESTINY’s imagery is the more amazing as all had to be done with the immovable, hand-cranked camera, and night shots were still impossible. These pictorial visions are so precise that they sometimes evoke th eillusion of being intrinsically real. A “drawing brought to life”, the Venetian episode resuscitates genuine Renaissance spirit through such scenes as the carnival procession – silhouettes staggering over a bridge – and the splendid cockfighting radiating bright and cruel Southern passions in the mode of Stendhal or Nietzsche. The environment, unlike some of the purely decorative films, is crucial to the meaning. Fate, holding all of the characters in its inevitability, becomes the main actor, and manifests itself in the settings. 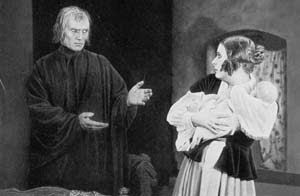 Even Death, who appears almost sympathetic to the appeal from the girl (the German title of the film means “the tired Death”), is compelled by Fate to carry on with his grisly work. It is not surprising that such thematic content has interested modern political historians.